Does God's Name Jehovah belong in the New Testament? 144,000 - a literal number? How should YHWH be translated? The word Jehovah has never been found in any New Testament manuscript. Watchtower reasons that Jehovah was originally there, but removed without trace. This undermines the integrity of the entire Bible, as if such a significant word has been changed, what else is wrong? On the other hand, if "Jehovah" did not appear in the New Testament, the meaning of key New World Translation Scriptures change. Does the New World Translation (NWT) properly include Jehovah in the New Testament? Is it important for us to use the word Jehovah today? "The conventioners were thrilled to learn that this new translation restored the divine name Jehovah 237 times in the main text from Matthew to Revelation!" The New Testament is one of the most attested ancient works in existence. The Journal of Biblical Literature Vol. 87 p.184 has listed 5,255 known New Testament Greek fragments. The Tetragrammaton does not appear in the New Testament either as YHWH or as the Greek transliterations PIPI, YAW and Iabe in a single one of these ancient New Testament manuscripts. This is despite "some papyrus fragments of the Christian Greek Scriptures that go back to the middle of the second century." (w82 3/15 p.23). On very rare occasion, Watchtower has admitted that there are no known New Testament fragments the contain the Divine Name. When attempting to build faith in the Bible the Watchtower asserts the New Testament is complete without omissions - silent in regards to their belief that the most important word has disappeared without trace. The story changes when explaining why the Watchtower Society added the word Jehovah into the New Testament, alleging the removal of YHWH from the New Testament during the second century. There is no proof to support this claim, as not a single ancient New Testament document has been found with YHWH in it. Several available manuscripts date back to this period. P47 dates prior to 300 A.D. and contains four uses of Kyrios from Revelation that the NWT translates as Jehovah. P66 dates from around 200 A.D. from John (written in 98 A.D) and contains five occurrences of Lord that appear in the NWT as Jehovah. Some manuscripts go back to within 25 years of John's writings, yet none contains YHWH. There is much evidence that YHWH never appeared in the New Testament. Most obvious is the absence of YHWH in any of the 5,000 discovered Greek New Testament manuscripts. Important evidence is also contained in the writings of the early Christians. These are referred to as the Apostolic Fathers and Ante Nicene Fathers who wrote from the times of the Apostles to the third century. This includes Polycarp, who studied with the Apostle John and Justin Martyr who lived from 110 to 165 A.D. Their extensive writings are a source of information on the early Church, including the formulation of the Trinity doctrine and the development of the Bible Canon. Yet in their writings there is no discussion about the removal of God's name from the Scriptures. If a global conspiracy existed to remove YHWH from the all New Testament manuscripts debate most certainly would have occurred between these writers. "But to the Father of all, who is unbegotten, there is no name given. For by whatever name He be called, He has as His elder the person who gives Him the name. But these words, Father, and God, and Creator, and Lord, and Master, are not names, but appellations derived from His good deeds and functions." Justin Martyr shows that Christians referred to the Father by appellations, but not a name such as Jehovah. As we do not have the actual original copies that the Bible writers penned it is always possible to say that YHWH may have appeared in the original copy. However the weight of evidence shows that YHWH was not in the original copies. If the Watchtower claims God allowed men to edit out his name "YHWH" and that no proof has been found to its existence to this day, how can a person have confidence in any of the New Testament? The New Testament is one of the most attested ancient documents. The reason a person places trust in it is their conviction that God ensured the Bible has come down to us accurately. 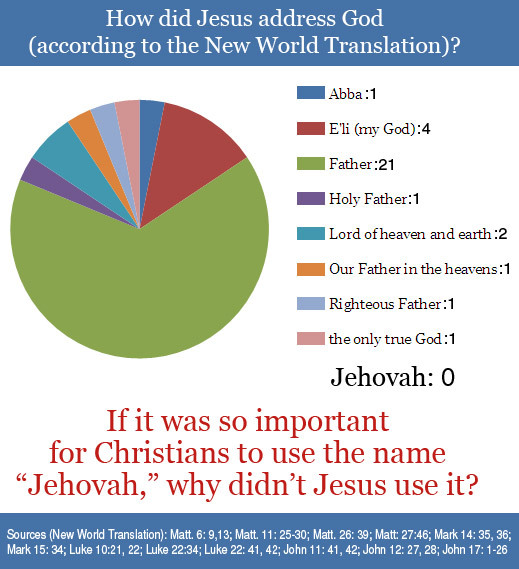 If use of the name Jehovah is so important one must wonder why the word never appears in any existing New Testament documents. If God inspired and protected the Bible, keeping the Bible accurate throughout all history why does his name not appear in the oldest Greek manuscripts or in the very first Bible, the 5th century Latin Vulgate? 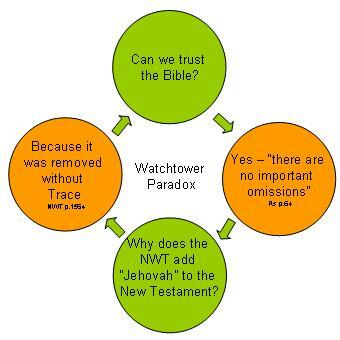 With no proof of its inclusion, the Watchtower uses four hypotheses to justify the statement that the Tetragrammaton was removed from the New Testament. The most significant supporting evidence used by the New World Translation translators for inserting Jehovah in the New Testament are the J versions of the Bible. From 1385 A.D. onwards, the New Testament Greek manuscripts started to be translated into certain Hebrew versions with the inclusion of YHWH. It is essential to understand that these have no connection whatsoever with the Hebrew Scriptures or Old Testament manuscripts and were not translated until well over one thousand years after Jesus death. These versions are numbered J1 to J27. Two versions commonly referred to in the New World Translation are J7 and J18. J7 was translated from the King James Greek text in 1599 by Elias Hutter, and forms part of the 1599 Hutter Polyglot. J18 was translated in 1885 and printed by The Trinitarian Bible Society in London. These versions of the New Testament can not be used as proof of YHWH in the original text as the first version was not until the fourteenth century. They are translated from Greek Manuscripts that we have access to today, documents that use Lord, not YHWH, and so are neither accurate representations of the source they use, or the original documents. To the uninformed reader it would appear there are 18 sources supporting Jehovah and only 2 supporting Lord. In reality there are far more sources than just these two supporting Lord. More importantly, whilst the J versions are translations that only date back to the fourteenth century, B refers to the Vatican MS. No. 1209 dating back to the fourth century. Why did the NWT translators put more trust the wording of Bible translations written over one thousand years after the death of Jesus in preference to the Ancient Greek manuscripts they were taken from? This is similar to a translator choosing to include the spurious wording of 1 John 5:7 as found in the King James Version "For there are three that bear record in heaven, the Father, the Word, and the Holy Ghost: and these three are one" in favour of what actually appears in the Greek manuscripts. (J7) "Sanctify Jehovah God (who is Christ) in your hearts, ..."
(NWT) "But sanctify the Christ as Lord in your hearts, ..."
J7 includes YHWH in reference to Jesus at Acts 9:5. ""Who are you, YHWH?" Saul asked. "I am Jesus, whom you are persecuting," he replied." "He asked: “Who are you, Lord?” He said: “I am Jesus, whom you are persecuting." (J14) "...no one can say "Jesus is Lord Jehovah, except by the Holy Spirit." (NWT) "nobody can say: "Jesus is Lord!" except by holy spirit. (J7,8,13,14,16,17,18,22,23,24) "The Lord Jehovah grant unto him that he may find mercy of the Lord Jehovah in that day..."
(NWT) "May the Lord grant him to find mercy from Jehovah in that day." Whilst Watchtower gives lip service to the J versions to support its use of Jehovah in the New Testament, it does so inconsistently for its own convenience. The Watchtower claims it rightfully restores Jehovah when Christian writers quoted from the Old Testament. This is based purely on speculation, particularly with no evidence of such in the Ancient Greek manuscripts. It is astonishing to examine the Watchtower translator's claims with what they did in practice. "The modern translator is warranted in using the divine name as an equivalent of ("kurios") and ("theos") , that is, at places where the writers of the Christian Greek Scriptures quote verses, passages, and expressions from the Hebrew Scriptures or from the LXX (Greek Septuagint) where the divine name occurs." Re-examining the above quote from the Insight Book reveals that it is actually the recent Hebrew J versions and not the Hebrew Old Testament Scriptures that have been used to confirm the 237 occurrences. "Turn to me and be saved, all YOU [at the] ends of the earth; for I am God, and there is no one else. By my own self I have sworn-out of my own mouth in righteousness the word has gone forth, so that it will not return-that to me every knee will bend down, every tongue will swear, saying, 'Surely in Jehovah there are full righteousness and strength. This is paraphrased at both Romans and Philippians. Whereas in Romans Jehovah is inserted in the NWT, in Philippians it is not, as to do so would result in equating Jesus with Jehovah. Romans 14:11 "For it is written: "'As I live,' says Jehovah, 'to me every knee shall bend down, and every tongue will make open acknowledgment to God.'"" Philippians 2:9-11 "For this very reason also God exalted him to a superior position and kindly gave him the name that is above every [other] name, 10 so that in the name of Jesus every knee should bend of those in heaven and those on earth and those under the ground, 11 and every tongue should openly acknowledge that Jesus Christ is Lord to the glory of God the Father." 1 Thessalonians 4:16,17 refers to Psalm 47:5. In this example the NWT chose not to follow the J versions. Psalms 47:5 "God has ascended with joyful shouting, Jehovah with the sound of the horn." (J-7,8,13,14,24) "For the Lord Jehovah himself shall descend from heaven with a shout, with the voice of the archangel, and with the trump of God: and the dead in Christ shall rise first: Then we which are alive and remain shall be caught up together with them in the clouds, to meet the Lord Jehovah in the air: and so shall we ever be with the Lord Jehovah." (NWT) "because the Lord himself will descend from heaven with a commanding call, with an archangel's voice and with God's trumpet, and those who are dead in union with Christ will rise first. 17 Afterward we the living who are surviving will, together with them, be caught away in clouds to meet the Lord in the air; and thus we shall always be with [the] Lord." It is likewise when Peter refers to Jesus when quoting Psalms. The J versions use Jehovah whilst in this case the NWT chooses not to. Psalm 34:8 "Taste and see that Jehovah is good, O YOU people; Happy is the able-bodied man that takes refuge in him." (J13, J14) "If you have tasted the kindness of the Lord Jehovah"
(NWT) "provided YOU have tasted that the Lord is kind. 4 Coming to him as to a living stone, rejected, it is true, by men, but chosen, precious, with God." Psalms 102:25 is quoted at Hebrews in reference to Jesus. In this verse from Hebrews it is the Father that is talking to Jesus. The J versions have the Father referring to Jesus as Jehovah, something the NWT obviously has chosen to avoid doing. (J-8)"Thou, Lord Jehovah, in the beginning didst lay the foundation of the earth and the heavens are the works of thy hands"
(NWT) "And: "You at [the] beginning, O Lord, laid the foundations of the earth itself, and the heavens are [the] works of your hands." In 1977, George Howard published a thesis showing certain versions of the Greek Septuagint translation of the Old Testament retained YHWH. These manuscripts may have been ones that Christian writers quoted from. Howard theorized these Christian writers therefore may have used YHWH in the original manuscripts of books that came to be included in the New Testament. His reasoning is promoted by Watchtower as fact. Howard's work did not examine the use of YHWH in the New Testament, but the use of YHWH in the Old Testament. Howard then presents a theory that YHWH may have appeared in the New Testament, which Watchtower chooses to present as fact. Howard's work contradicts the Watchtower concept that YHWH was not removed from the Septuagint until the second century after Jesus. See the following discussion from the NWT Reference edition. "Concerning the use of the Tetragrammaton in the Christian Greek Scriptures, George Howard of the University of Georgia wrote in Journal of Biblical Literature, Vol. 96, 1977, p. 63: "In the following pages we will set forth a theory that the divine name, YHWH (and possibly abbreviations of it), was originally written in the NT quotations of and allusions to the O[ld] T[estament] and that in the course of time it was replaced mainly with the surrogate ? [abbreviation for Ky´ri·os, "Lord"]. This removal of the Tetragram[maton], in our view, created a confusion in the minds of early Gentile Christians about the relationship between the 'Lord God' and the 'Lord Christ' which is reflected in the MS tradition of the NT text itself." "(2) Concluding Observations. The above examples are, of course, only exploratory in nature and are set forth here programatically. Nevertheless, the evidence is sufficiently strong to suggest that the thesis of this paper is quite possible. We have refrained from drawing too many conclusions due to the revolutionary nature of the thesis. Rather than state conclusions now in a positive manner it seems better only to raise some questions that suggest a need for further explanation." In "Kyrios or Tetragram: a Renewed Quest for the Original LXX," in De Septuaginta Studies in Honour of John William Wevers , Mississauga, Ontario, 1984, p. 85-101, A. Pietersma also presents that kurios was originally used in the Septuagint and later YHWH was re-introduced in some revisions under the influence of Palestinian Jews. A few Greek copies down to the middle ages still contain YHWH. The research of Howard, Pietersma and others show that YHWH was removed from the Septuagint versions used by non Jews prior to Christian times. The Christian writers were quoting from Septuagint versions that used Kurios in place of YHWH. However, YHWH does appear in occasional versions of the Septuagint that were written for Jews. This proves that there was no second century conspiracy to remove YHWH from all versions of the Septuagint (and hence also the New Testament). 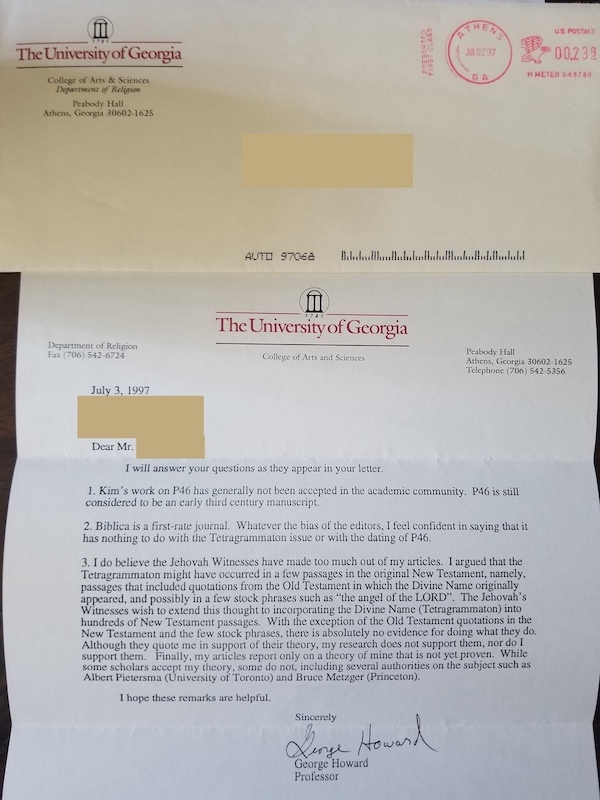 A personal letter from Howard, dated July 3, 1997, explains Watchtower has mis-used him by indicating his comments are anything other than an unproven theory. "I do believe the Jehovah's Witnesses have made too much out of my articles. ... I argued that the Tetragrammaton might have occurred in a few passages in the original New Testament ... The Jehovah's Witnesses wish to extend this thought to incorporating the Divine Name (Tetragrammaton) into hundreds of New Testament passages. With the exception of the Old Testament quotations in the New Testament and the few stock phrases, there is absolutely no evidence for doing what they do. Although they quote me in support of their theory, my research does not support them, nor do I support them. Finally, my articles report only on a theory of mine that is not yet proven." There is a tradition that Matthew wrote his gospel first in Hebrew and then re-wrote it in Greek, however this is open to debate. The earliest manuscript we have of a Hebrew Matthew is from the 1380's and it is unknown who wrote the original Hebrew version this is based on. YHWH does not appear in it, but rather it uses the circumlocution "The Name". The Watchtower theorizes that Matthew was the author and the original document used YHWH rather than "The Name". This document does not contain evidence of YHWH appearing in the New Testament. The Watchtower again extrapolates that it is reasonable to add it. Even if YHWH had appeared in the Hebrew version of Matthew, since this was the only book of the New Testament that may have been written in Hebrew, the same reasoning can not be extended to the Greek books. When adding the word Jehovah to the New Testament the Watchtower makes an unsubstantiated assumption based on how they wish to interpret doctrine. This is a serious misrepresentation of scripture. Doctrine should be formed by scripture; scripture should not be changed to support doctrine. Inaccurately inserting the word Jehovah into the New Testament changes the meaning of Jesus message to his followers in a number of ways. One important affect is that the Watchtower attempts to use the word Jehovah to prove that only Jehovah's Witnesses will be saved. The book Reasoning from the Scriptures claims use of God's name is one of the 10 things that identify true worshippers. Watchtower publications quote Romans 10:13 to show that use of the word Jehovah is a requirement for salvation. Yet an examination of the Emphatic Diaglott, published by the Watchtower Society shows that the word used in this passage is not YHWH but Kyrios (κύριος) - Lord. Just prior to this verse Romans 10:9 states "Jesus is Lord (Kurios)" and so it follows that Romans 10:13 refers to Jesus and identifying Jesus is the requirement for salvation. Another important effect of inserting the Tetragrammaton into the New Testament is regarding understanding the Nature of God. Jesus name in Hebrew is Yahoshua, meaning Yah is Salvation, and a number of scriptures that referred to YHWH in the Old Testament were quoted in reference to Jesus in the New Testament, such as when Romans 10:13 applies Joel 2:30 to Jesus. These scriptures, when translated accurately are important indicators of the oneness of the Father and the Son. This is difficult to detect in the New World Translation of the Bible. It is one of the anomalies of the Bible that the Holy Name stopped being used between the Old and New Testament. When a person reads the scriptures as originally written it can be understood what prompted the understanding of the Trinity and the great importance we need to put on our relationship with Jesus. Jesus is the name borne witness to. Acts 9:15 "But the Lord said to him: "Be on your way, because this man is a chosen vessel to me to bear my name to the nations as well as to kings and the sons of Israel." Acts 1:8 "YOU will be witnesses of me (Jesus) both in Jerusalem and in all Ju·de´a and Sa·mar´i·a and to the most distant part of the earth." Revelation 12:17 "So the dragon became enraged at the woman and went off to wage war with the remaining ones of her offspring, who observe the commandments of God and have the work of bearing witness concerning Jesus." Jesus is the name used to expel demons. Mark 9:38-39 "John said to him: "Teacher, we saw a certain man expelling demons by the use of your name and we tried to prevent him, because he was not accompanying us." But Jesus said: "Do not try to prevent him, for there is no one that will do a powerful work on the basis of my name that will quickly be able to revile me;"
Jesus is the subject of the kingdom good news. Galatians 1:7 "But it is not another; only there are certain ones who are causing YOU trouble and wanting to pervert the good news about the Christ." Jesus name invokes persecution, yet Jehovah's Witnesses claim their persecution in the name of Jehovah fulfils prophecy. Matthew 24:9 "Then people will deliver YOU up to tribulation and will kill YOU, and YOU will be objects of hatred by all the nations on account of my name." Jesus name alone is the means of salvation. Acts 4:10-12 "… let it be known to all of ​YOU​ and to all the people of Israel, that in the name of Jesus Christ the Naz‧a‧rene′, whom ​YOU​ impaled but whom God raised up from the dead, by this one does this man stand here sound in front of ​YOU. This is ‘the stone that was treated by ​YOU​ builders as of no account that has become the head of the corner.’Furthermore, there is no salvation in anyone else, for there is not another name under heaven that has been given among men by which we must get saved.”"
As their name implies, Jehovah's Witnesses predominant focus is on preaching about Jehovah whilst the message of the New Testament was to be witnesses of Jesus. The huge emphasis of the Watchtower on the name Jehovah detracts from the constant New Testament message of the Christ. Even when quoting scriptures such as Acts 4 the Watchtower manages to deflect attention from Jesus to Jehovah. Falsely inserting Jehovah into the New Testament is an important manipulation. Jehovah's Witnesses are led to believe that this proves they are the only true religion and the only ones that will be saved, due to being the only ones that consistently call on the name Jehovah. However, a reading of the New Testament as it was originally written results in a different understanding of this doctrine. If the early Christians did not use the divine name it can not be a prerequisite for salvation. Being aware the word Jehovah does not appear in the New Testament and knowing that the name was not promoted by Jesus changes significantly the message of salvation. It becomes apparent that calling on the word Jehovah is not a requirement for salvation. Overuse of the word Jehovah taints a Jehovah's Witnesses understanding of Jesus. True Christians need to feel comfortable giving Jesus the rightful honour that he deserves as a God and our saviour. You Can Live Forever in Paradise on Earth p. 41 makes the comment that "We learn God's name from the Bible, where it appears about 7,000 times." It is significant that YHWH appeared 7,000 times in the Old Testament but never in the New Testament. Even the Watchtower Society's Kingdom Interlinear Translation of the Greek Scriptures and the Emphatic Diaglott do not include Jehovah in the New Testament. The Bible does not specifically explain why the New Testament does not include the Tetragrammaton; however, there are several possible reasons. From a practical viewpoint, the reason YHWH does not appear in the New Testament is that it was not actively used in the first century A.D. Out of respect and fear of taking the name of God in vain (Exodus 20:7) the word Lord was spoken in place of YHWH for several hundred years before Jesus. It appears YHWH was no longer in regular use by the time of the Babylonian invasion over 500 years prior to Jesus, at least in languages other then Hebrew. The book of Daniel is written in both Hebrew and Aramaic, with the Aramaic portion being the larger section. YHWH is used in the Hebrew portions of Daniel but never in the Aramaic portion. As early as 250 B.C.E the Septuagint Greek translation of the Tenach replaced YHWH with 'Kyrios' (Lord). For example the Hebrew text of Leviticus 24:16 was changed from: "And whoever blasphemes the name of YHWH shall surely be put to death " to "And he that names the name of the Lord, Let him die the death"
"The Greek word kyrios. The latter is properly a Greek adjective meaning "having power or authority"; used as a noun, it means "lord, sovereign, master, owner." This is the standard word for "Lord" in the Septuagint (the ancient Greek translation of the Old Testament) and in the New Testament. Jesus regularly quoted or paraphrased passages from the Old Testament. From the words Jesus used when quoting, or more regularly summarising scriptures from the Old Testament, it appears Jesus used several different sources including the proto-Masoretic text, the Aramaic Targum and predominantly the Greek Septuagint (LXX), which replaced YHWH with the word for Lord. YHWH does not appear in most copies of the Greek Septuagint. When quoting Hebrew sources that contained the name, Jesus is unlikely to have uttered the word YHWH out loud, as it was illegal to do so. Consider what would have happened if Jesus did utter this sacred term. Jesus would have been in direct conflict with sacred tradition and the law and been accused of blasphemy by the Pharisees. Just as the Pharisees attempted to have Jesus arrested for blasphemy for calling himself the Son of God, they would have had him likewise arrested for illegally using the divine name. Yet Jesus was never accused of using the name in the scriptures. YHWH was very much a Jewish name. Exodus tells us that the Name was revealed at the time of Moses, two and a half thousand years after the creation of Adam. Exodus 6:3 "And I used to appear to Abraham, Isaac and Jacob as God Almighty, but as respects my name Jehovah I did not make myself known to them." By not revealing his name for over the a third of human history God shows that in itself the Tetragrammaton is not necessary for worship. It was not important for of the faithful men of old to use his name, the term God Almighty was how he wished to be referred to by them. It was only to the Jewish nation that he provided this identifier. By the time of Jesus the word Jehovah was not acceptable in common use. By not using it Jesus avoided offending Jewish seekers of truth and avoided stumbling Gentiles who would have identified YHWH as a Jewish word, making Christianity appear to be a Jewish religion. This could have inhibited the growth of Christianity throughout the inhabited world. The most important reason uttering YHWH was no longer necessary can be identified by reading the words of Jesus. How did Jesus instruct the disciples to refer to God? Jesus repeatedly instructed his followers to address God as our Lord or our Heavenly Father (Mt 6:8-18, 7:21, Mk 14:36) and this is the way Jesus followers refer to God if they wish to follow Jesus example. In the Lord's Prayer Jesus said to pray "Our Father in the heavens". John 12:27-28 "Now my soul is troubled, and what shall I say? Father, save me out of this hour. Nevertheless, this is why I have come to this hour. 28 Father, glorify your name." Therefore a voice came out of heaven: "I both glorified [it] and will glorify [it] again." John 14:13 " Also, whatever it is that YOU ask in my name, I will do this, in order that the Father may be glorified in connection with the Son "
John 17:5-6 " So now you, Father, glorify me alongside yourself with the glory that I had alongside you before the world was. 6 "I have made your name manifest to the men you gave me out of the world "
A Jew would not have understood this to mean that Jesus was glorifying the word YHWH. Jews consider the Father as having seven as names. As the word YHWH was not being uttered out loud in the first century, what would a Jew have understood by Jesus saying that he glorified the Father's name? Certainly they did not understand this to be that he was literally speaking of the word YHWH or any other of the seven terms used to refer to God. Jesus meant that he was glorifying God's reputation. A word or words by which an entity is designated and distinguished from others. A word or group of words used to describe or evaluate, often disparagingly. Representation or repute, as opposed to reality: a democracy in name, a police state in fact. Jesus made known the Father's qualities. He highlighted a loving God, rather than focus on the more legalistic and destructive qualities so readily identifiable in the Old Testament Yahweh. More intimate than referring to God Almighty or using the word Jehovah is the loving expression Father. To be able to refer to God as our Father is a wonderful privilege. Does a child normally refer to their father by their first name? No, the father-child relationship is far more loving and intimate than that. Once Jesus had revealed the truth about Jehovah Christians could enter a relationship with God based on a real depth of understanding and intimacy, and hence refer to him as their Father. Repeatedly Jesus used this term and instructed his disciples to do the same. Watchtower presents as fact that scribes removed YHWH from the New Testament during the second century, despite this only being a theory. It has only been on rare occasion that Watchtower has even admitted that there are no known New Testament fragments the contain the Divine Name. When this topic is discussed, they evasively refuse to mention the reason for why this is a question; that the Divine name does not appear in any ancient Greek manuscript in possession. The following Reasoning from the Scriptures, not at all mentioning it has never been found, even though that is the question they are answering. It is like a game of Jeopardy, "here is the answer, guess what the real question was?" "Why is the name Jehovah used in the Christian Greek Scriptures? "Bible scholars acknowledge that God’s personal name appears in the Old Testament, or Hebrew Scriptures. However, many feel that it did not appear in the original Greek manuscripts of the so-called New Testament." 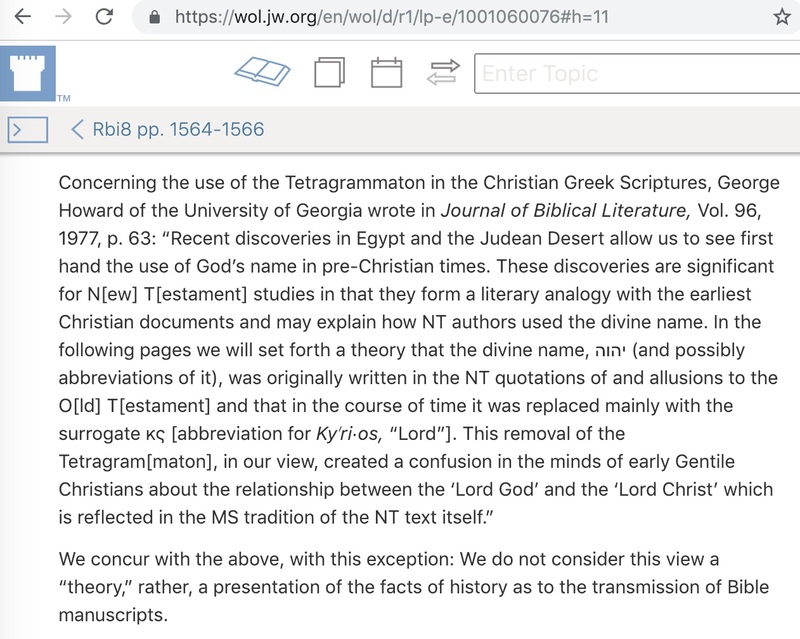 This obfuscation means that few Jehovah's Witnesses are aware that there is no solid evidence for including Jehovah in the New Testament, and that there are no New Testament fragments containing YHWH. Jehovah's Witnesses are led to believe that other translations dishonestly remove Jehovah from the New Testament, not that it is their own translation that is adding to God's word. The Watchtower presents the following paradox; Jehovah has not been found in the New Testament because it has been tampered with, but the Bible has been inspired and accurately preserved by Jehovah. The divine name appears over nearly 7,000 times in the Old Testament. By Jesus time, it had been removed from most Old Testament translations yet Jesus never mentioned or criticised the removal. As this indicates that Jesus did not feel this was an important omission whether Jehovah appears in modern translations of the Old Testament is up to the discretion of the translation. On the other hand, as Jehovah does not appear in the New Testament it so should not be added to by translations such as the NWT. As Jehovah was not used in the New Testament, use of the word Jehovah cannot be a necessary requirement for salvation. Rather, the New Testament shows that Jesus is the name through which salvation comes. Jesus words show that God is to be addressed as Lord or Father. By the time of Jesus, YHWH was not in regular use. The divine name does not appear in any known manuscripts of the New Testament, indicating that Jesus kept to the tradition and law on not using the Divine Name. To include Jehovah in the New Testament the Watchtower Society has taken liberties with God's Word. An assumption has been made in order to give weight to Watchtower doctrine. The effect is an inaccurate understanding of what Jesus taught. It affects a Jehovah's Witness ability to reason correctly on subjects such as the Trinity and to understand what the Bible says as to Jesus' role in salvation. For a detailed discussion of the topic, and full list of the 237 Watchtower occurrences of Jehovah, see the 360 page, 1.9Mb PDF The Tetragrammaton and the Christian Greek Scriptures. Written 2007. Latest update Aug 2017.